Leucophyllum langmaniae ‘Lynn’s Legacy’ is one of the most profuse and long-lasting bloomers when compared to other types of Texas sage. This variety looks impressive planted en masse in water-wise gardens. 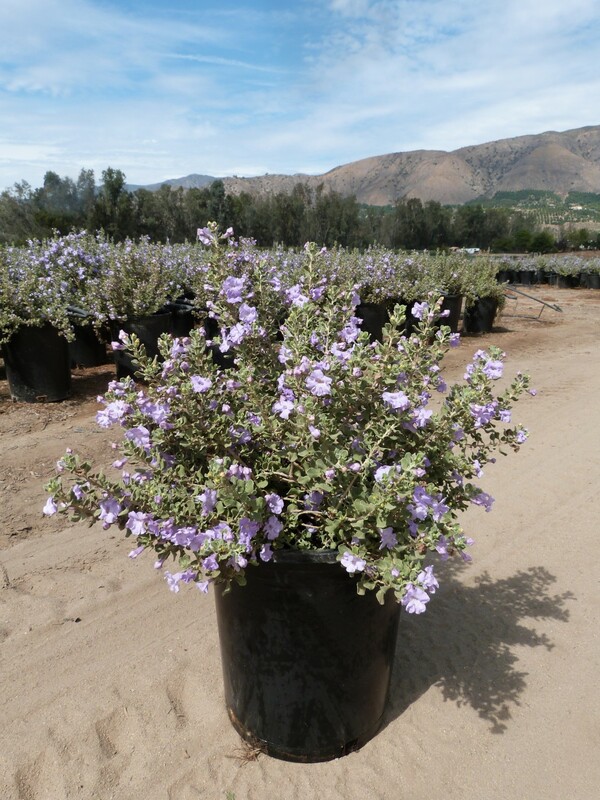 Due to its toughness, it can take extreme heat and drought and can be planted in troublesome areas such as roadsides, parking lots, and in areas without an irrigation system. Plants also tolerate reflected heat from these surfaces. Lavender flowers cover the shrub entirely when in bloom, providing a shock of intense color. Flowers form along the stem and are about an inch in size. The masses of flowers also provide excellent foraging for local bees. ‘Lynn’s Legacy’ is very dense and rounded in shape. Its foliage is a light to medium green in color compared to other Texas Sage varieties that have more of a silver sheen to them. Though very attractive, please note that ‘Lynn’s Legacy’ grows slightly slower than other varieties of Texas sage. Plant ‘Lynn’s Legacy’ in full sun for best results in growth and in bloom density. Once established, this shrub needs very little water to thrive and flower. Texas sage prefers well-draining soils to perform its best and to avoid root rot. This beautiful shrub has hardly an issues with pests or diseases.